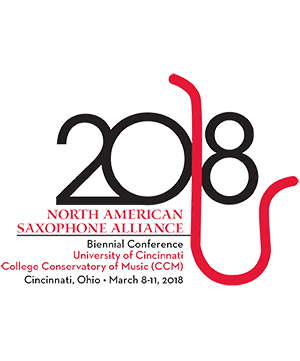 Mark your calendars now to join us March 8-11, 2018 for the NASA 2018 Biennial Conference at University of Cincinnati College - Conservatory of Music in Cincinnati, Ohio. You may click on the photo for a higher resolution version of the photo. Bio: Los Angeles-based concert saxophonist Jessica Maxfield enjoys an active career as an accomplished performer, educator, clinician, and adjudicator. Currently instructing classical saxophone at the University of Southern California's Thornton School of Music, she has also concertized and presented clinics throughout the United States, Austria, Belgium, France, The Netherlands, Norway, Ukraine, and Japan. Notable appearances include the Chicago Symphony Orchestra, the Milwaukee Symphony Orchestra, the Chicago Philharmonic and the Joffrey Ballet. Dr. Jessica Maxfield holds degrees with distinction from Bowling Green State University and Northwestern University, where she recently completed a Doctor of Musical Arts and served as a Lecturer of Saxophone under the guidance of the legendary Dr. Frederick Hemke. She is a Conn-Selmer artist-clinician and hosted the North American Saxophone Alliance's Region 5 Conference at Northern Illinois University in January 2015.